If you’re like me, you’ve had a moment where you thought your content was outstanding, in the true sense of the word – you really thought it stood out above the competition. Then you looked around and discovered your unique, original, and unmatched ideas were run-of-the-mill. Suddenly, you felt like you were attending the fourth-grade talent show and realizing your kid was just one of 30 equally precious snowflakes with misguided trombone aspirations. Let’s say you do produce original and engaging content. If so, you’ll likely discover an insane pace of imitation. The minute you create a standout piece, your competition is only three months away from turning that originality into part of the clutter. Your content is only as good as its ability to consistently stand out as original and engaging – and stay that way. These realizations inevitably lead to a recognition that your team’s creative engine is the real competitive advantage for content marketers. As the marketing lifeblood, it needs to be in peak shape, primed to furiously churn out unorthodox taglines, compelling visuals, and innovative angles that will keep you ahead of the pack. Yeah, your creatives have your brand’s marketing life in their hands. Here are five essential steps to prime your creatives – designers, videographers, writers, etc. – to crank out outstanding, clutter-busting content that keeps your content ahead of the competition. Tension between productivity and creativity is real, but the either-or mentality is a paradigm in need of a shift. It’s not a zero-sum game. You can have more of both productivity and creativity. Adobe’s State of Create: 2016 study found that 83% of U.S. respondents felt increasing pressure to be productive rather than to be creative. This reflects a false trade-off many perceive in the professional world – that productivity and creativity are mutually exclusive and somehow counter each other. In the same study, 81% of respondents said investing in creativity increases employee productivity – overcoming the either-or paradigm. Although more than 75% recognized the value of creativity to society and the economy, only one-third felt they were living up to their creative potential. Take all these stats and you start to see how destructive the productivity vs. creativity paradigm can be to productivity, organizational effectiveness, morale, and retention. Certain types of distraction can contribute to the creative process. An illustration professor of mine was fond of saying, “You cannot create in a vacuum.” While I know some physicists would argue the scientific validity of this statement, it is certainly true for creativity. “Good” distractions lend inspiration, give your hardworking brain a break, and provide material from which to draw inspiration for your next piece of content. If you visited the work spaces of the special effects artists who fuel the top-grossing sci-fi summer blockbusters – perhaps the most insanely talented but unrecognized creatives on the planet – you might think you took a wrong turn into the studio’s junk closet. The walls are plastered with movie posters, album covers, and disembodied ghoul heads. Shelves overflow with latex appendages, action figures, clusters of paper clips, and modelling clay transformed into miniature monsters in moments of boredom. Bad distractions should be identified and eliminated in order for creativity to flourish. Which are the bad ones? 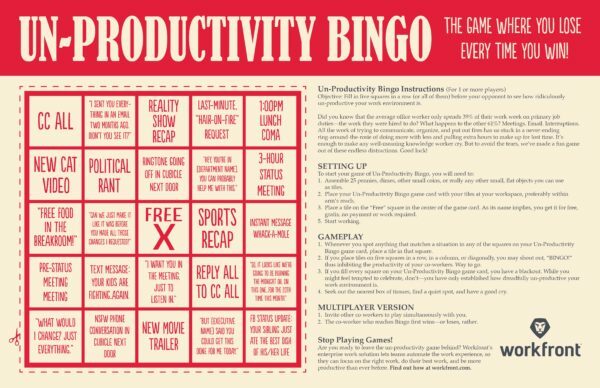 Choose any of the squares on this Un-Productivity Bingo card we created. Hardwire your processes to head off unproductive distractions, like dropping in unannounced for status updates, making creatives manually enter information into spreadsheets, or holding regular meetings where everyone takes turns reporting. Map your workflow in detail and eliminate the unproductive, non-creativity-inducing tangents. Incorporate into your workflow the tools to automate manual communication and reporting tasks to free up time and space for creativity. How does the old saying go? “Necessity is the mother of invention?” Creativity may want to run free, but it produces its finest material within established parameters and with specific problems to solve. Delivering well-defined requirements up front minimizes frustration once the creative process starts – as long as you don’t pull the proverbial rug from under your creatives by changing project goals, vision, timelines, or scope. Embrace the creative brief and stick to the plan. The responsibility to define parameters falls squarely on the shoulders of the content manager. Gather information on project background, goals and targets, audience, timelines, and core messaging at the start and force requesters to commit to those requirements before any creative work begins. Like the rest of us, most creatives are not satisfied with merely creating a great-looking or well-read project – they want that content to do its job. Perform its purpose. When they know how well or poorly their work is doing, they are driven to make tweaks and adjustments to help it succeed. In fact, feeding your creatives performance data on the work they’ve done has a similar effect as defining parameters and guidelines (Step 4). The more well-defined the challenge, the more they focus their creative powers on overcoming that challenge. Harvard researchers even identified that the single most important factor to drive creative and productive performance is making progress in meaningful work. A focus on progress also increases employee engagement – and with a 2017 Gallup poll showing that only 33% of U.S. employees feel “engaged” in their work – a vital responsibility for managers. 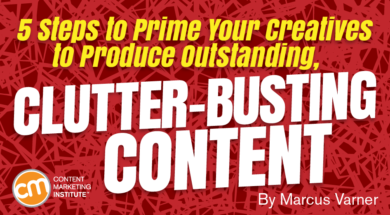 If you want your content to stand out and actually do what it is meant to do, then prime your creatives to produce clutter-busting content with these five steps. Fuel the creativity and engage your team to produce content. Who knows, you just might hit it out of the park, like the lone fourth-grader who stole the talent show with one as original as Darcy Lynne’s singing ventriloquist. Editor’s note: We appreciate Workfront’s support of Content Marketing Institute as a paid benefactor. This article was reviewed and edited independently to ensure that it adheres to the same editorial guidelines as all blog posts.